International Journal of Social Networking and Virtual Communities (Int J SocNet & Vircom) is designed to provide a forum for academics, researchers, practitioners, and users to publish rapidly original papers and reviews on: Communities of Interest, Communities of Relationship, Gaming Communities, Communities of Transaction, Peer-to-Peer Communities, Innovation Communities, Mobile Communities, Development of Virtual Communities and the role of user-generated content within Virtual Communities. Kindly please download the template in DOC or Latex. 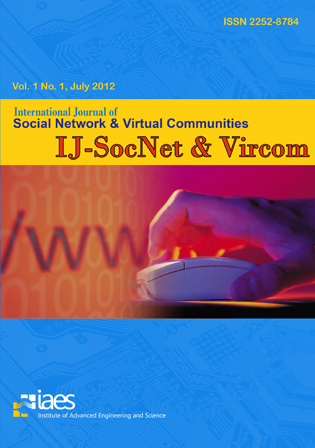 The "Int J SocNet & Vircom" covers research in all areas of social networking and virtual communities.